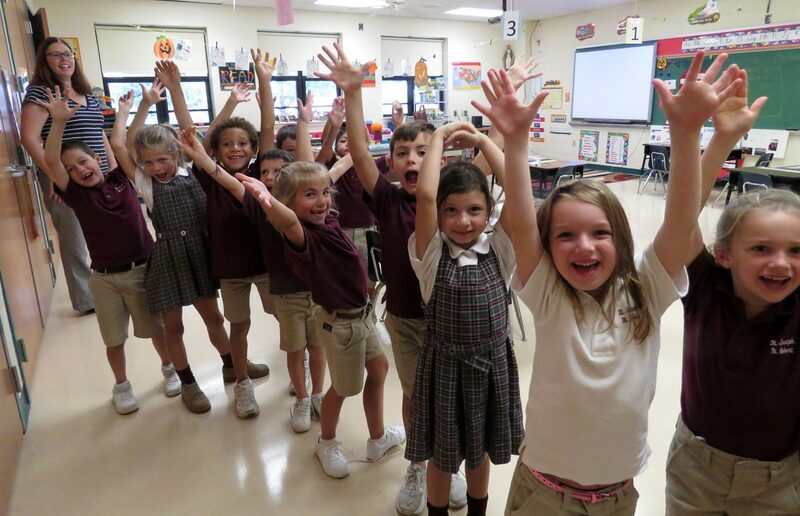 Students of St. Joseph-St. Robert School in Warrington celebrate the announcement Oct. 1 that their school was among several in the Archdiocese of Philadelphia to be named a Blue Ribbon School of Excellence by the U.S. Department of Education. A stunning nine Catholic elementary schools within the Archdiocese of Philadelphia were among the 49 private or religious elementary or high schools nationwide to be named Blue Ribbon Schools of Excellence this year by the United States Department of Education, it was announced Oct. 1. Eight of the schools were parish or regional schools of the archdiocese. They were St. Joseph/St. Robert School, Warrington; St. Jude School, Chalfont; St. Katharine Drexel School, Southampton; St. Mary Magdalen School, Media; SS. Peter and Paul School, West Chester; Mater Dei School, Lansdale; Our Lady of Mercy Regional School, Maple Glen and Our Lady of Mount Carmel School, Doylestown. Also named was one private Catholic elementary school, Ancillae-Assumpta Academy, Wyncote. To put it into perspective, a grand total of 349 high schools or elementary schools were named Blue Ribbon schools nationwide this year. This includes 19 schools for all of Pennsylvania, of which nine were Catholic schools within the Philadelphia Archdiocese. There were only two other schools within the five counties of the archdiocese, both Philadelphia public elementary schools: Albert M. Greenfield School and William M. Meredith School. “We are elated to have eight of our regional and parish elementary schools chosen among only 49 non-public schools across the country as part of this year’s National Blue Ribbon cohort,” said Dr. Andrew McLaughlin, secretary for elementary education for the archdiocese. “We are particularly proud that these schools have been recognized for their commitment to academic excellence. The National Blue Ribbon School program is now in its 36th year and it recognizes schools either as Exemplary High Performing Schools or as Exemplary Achievement Gap Closing Schools. St. Joseph-St. Robert School was founded in 1925 originally as St. Joseph School with a mission of “producing contributing members of the church and the global community.” It offers rigorous, relevant curriculum through such tools as technology initiatives. Faculty members use a variety of methods and materials to ensure the various learning needs and styles are met. It believes open collaboration between the faculty and parents sets it apart. St. Jude School, in its 55th year, illustrates its academic values through STREAM (Science, Technology, Religion, English language, Arts and Mathematics). It is committed to service to others inspired by the charism of the Sisters of Mercy. Student spiritual life is nurtured by daily prayer, catechetical instruction, the sacrament of reconciliation and participation in the Mass on a regular basis. St. Katharine Drexel School was founded in 2012 bringing together students from Bucks County parishes Assumption B.V.M., St. Vincent de Paul and St. Bede the Venerable, among others. It prides itself on being an exceptional Catholic elementary school built for the future. The campus includes a state-of-the-art Digital Media Center, an Arts and Science Center and a gymnasium with a performing arts stage. Chromebooks and I Pad computers are part of daily instruction. St. Mary Magdalen School is in its 53rd year and is committed to cultivating and encouraging the development of its students within the context of faith and love and affording students every opportunity to succeed at a variety of levels. Older students mentor younger ones as prayer partners. Additionally the school focuses on stewardship; all students are encourage to share their time and talents with others. Mater Dei School was established in 2012 through the consolidation of schools in Hatfield, North Wales and Lansdale and has a strong commitment to academic excellence for all students and provides Honors English and Honors Math for students who qualify, along with a modified curriculum for students who need it. The school recognizes that knowledge, enlightened faith, excellence, service and community are the heart of Catholic education. Our Lady of Mount Carmel, in its 143rd year, is a two-time Blue Ribbon school. It cites its technology and other unique educational initiatives as areas that make it stand out from other schools. Recent contributions from the pastor, the Home and School Association and other supporting groups have funded an ecological greenhouse facility, extensive security camera system, safety improvements to the lobby entrance and a cafeteria renovation. Our Lady of Mercy Regional Catholic School was founded in 2012, uniting students from Montgomery county parishes St. Alphonsus, St. Anthony of Padua and St. Catherine of Siena. It has mushroomed into an expansive academic complex with state-of-the-art science lab, next generation STREAM curriculum, library extended care program, computer lab and dedicated facilities for music, art, Spanish language and a comprehensive physical education and health program. SS. Peter and Paul School was established in 2001 with a mission for dedicated academic excellence and development of future leaders to be disciples of Christ with hearts and hands to love and serve. School programs emphasize faith, service, leadership and knowledge. In addition to the emphasis on faith and service, the school also instills a desire to learn and prepares the whole child with practical application to the real world. Ancillae-Assumpta Academy is a ministry of the Handmaids of the Sacred Heart and lay faculty founded in 1945, and has a clearly articulated curriculum rooted in Gospel values and focused in 21st-century skills. It is committed to providing a wholesome, comprehensive program addressing the spiritual, cultural and physical needs of the students. It was also named a Blue Ribbon School of Excellence in 1986, 1992 and 2010. All of this year’s Blue Ribbon schools will hold special celebrations in the coming weeks. Representatives of each school are invited to the formal recognition ceremonies Nov. 7-8 in Washington, D.C.
Teachers and staff of St. Joseph-St. Robert School, along with the parish pastors who support it including Father Joseph Bordonaro of St. Joseph (right) and Msgr. James Beisel of St. Robert Bellarmine, both in Warrington, celebrate the school’s national Blue Ribbon designation. That’s really great but what about the schools in the city? I realise those are poorer communities so less resources, but is there a way the money from the wealthier areas can be shared with the Philly schools? And not gangs of high school students fulfilling their service ministries–which is nice in and of itself–but real sustainable contributions like stocked libraries (and librarians), computer rooms, language classes, etc. Can we not put real action behind helping “the dear neighbor” to accomplish tangible results?